It is all over the news about the fires; the Carr Fire has Hwy 299 closed and the Mendocino Complex has Hwy 20 closed; so it would be very hard to reach the Trinity River, plus, most of the upper part of the river is so smoky that you would have trouble finding your way to the river. The fires are also affecting the river flows because of the power plants having to reduce power production or having to go off line. The upper river has experienced water releases of 1,200cfs all the way down to 750cfs. This fluctuation has caused an inundation of the low areas around the lake because of the water diversion system is not working properly due to the fires. The Lewiston area has been evacuated as are many of the areas around the Redding area. This affects the Sacramento River as well. I am sorry to say that the fires are devastating northern California in more than just fishing. Because of the fires, much of the flow and lake levels are not available for this report. The good part is that with the fluctuation of the water releases it could bring in part of the fall run Chinook. Remember I said could possibly bring them into the river NOT for sure. The fires could possibly cool the upper river down some, but as of today, that has not happened. 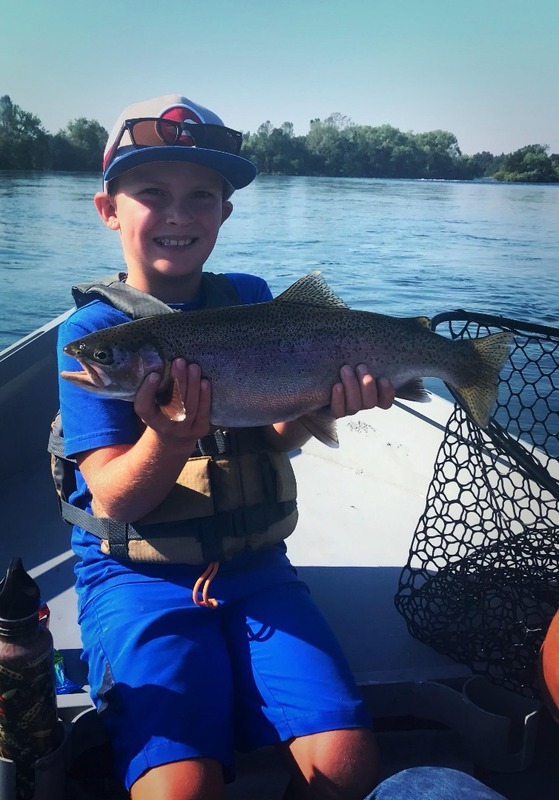 Fishing: Lewiston Dam is now releasing summer flows of 779cfs., and because of the evacuations and Carr Fire, there is practically no fishing in the upper section of the river. Down river to Junction City the smoke has just about caused everyone to stay inside out of the smoke. Del Loma is faring much better, and Willow Creek the smoke is just a haze, but the river temperatures are in the 70's so the fish are holding up for right now. With the water flow fluctuation, hopefully, the water temperatures will drop and the fall run Chinook will start their migration up the river. Mid-Klamath: Iron Gate Dam is releasing summer flows of 974cfs. Here again, we have problems from the fires. Iron Gate has to release more water for power production and that will change things in the upper part of the Klamath. Right now the Mid –Klamath is doing fine because there is very little smoke, but again, we have high water temperatures. We have to realize that we are into the midsummer weather and that usually means HOT sunny weather. Don’t forget there are some river closures for Native American Ceremonies. Lake Conditions: Whiskeytown is N/A% of capacity (an increase of 0%) with inflows of N/A cfs and releasing N/A cfs into Clear Creek and on to Keswick. Shasta is N/A% (a decrease of 0% and 0ft) with inflows of N/A cfs and releasing N/A cfs, Keswick is N/A% of capacity (an increase of 0%) with inflows of N/Acfs and releasing N/Acfs; Oroville Lake is 55% capacity (a decrease of 3% & minus 9ft), inflow is 2,324cfs and releases are 6,936cfs; Folsom Lake is 66% of capacity (minus 6% & minus 6ft.) inflows are 1,752cfs and releases are 5,111cfs. Trinity Lake: the Lake is N/Aft below the over flow (a decrease of 0ft) and N/A% of capacity (02% decrease) Inflow to Trinity Lake is N/A5cfs and Trinity Dam is releasing N/Acfs to Lewiston Lake with N/Acfs going to Whiskeytown Lake and on to Keswick Power Plant, which is releasing N/Acfs into the Sacramento River. Trinity River flows and conditions: Lewiston Dam releases are 779cfs with water temps of 52 degrees and air at 62 at 9:00am today, Monday. Limekiln Gulch is 5.4ft at 815cfs, with water temps of 52 degrees. Douglas City is 6.9ft at 793cfs, water temps of 53.4 degrees and air is 63. Junction City is 2.4ft at 755cfs. Helena is 9.7ft at 789cfs with water temps of 58.8. Cedar Flat (Burnt Ranch) is 2.5ft at 862cfs. Willow Creek is estimated at 923cfs and air is 70 with water at 65. Hoopa is 12.4ft at 1,297cfs with water temps of 71.4. Flows at the mouth of the Trinity River at Klamath River are estimated to be 2,825cfs. Salmon usually cannot do well in water temperatures over 72 degrees. Klamath: Iron Gate Dam releases are 974cfs. Seiad Valley is 1.9ft at 1,118cfs. Happy Camp is estimated at 1,276cfs, Salmon River is 1.7ft at 252cfs, Somes Bar is estimated at 1,276cfs and Orleans is 2.8ft. at 1,528cfs and the Klamath River at Terwer Creek is 8.2ft at 2,766cfs, with water temperatures of 72.2 degrees. Flows at Dr. Fine Bridge are 4.9ft at 333cfs. The low temperature in the Valley last week was 56 but ran in the low 60s a high of 104, with 0.00in of rain and a season total of 68.45in of rain and a total of 4.15in of snow. Temperatures in the valley next week are expected to run 87/56 degrees with sunshine in the coming week. Expect smoke in the upper river area and haze in the lower river areas. What Will Happen to the Trinity?